Minnesota winger Nino Niederreiter’s winning goal in overtime of Game 7 bounced out of the net and hit Avalanche goaltender Semyon Varlamov in the back of the leg before he could turn around. The final score of the series was 22-20 over seven games. Three were empty-net goals, two by Minnesota and one by Colorado. Eliminate those and the final score was 20-19 in favor of Minnesota. Close, in other words. But a pattern that developed over the first-round playoff series repeated itself in the decisive seventh game so insistently that it was hard not to get the point. In spurts of awe-inspiring talent, the Avalanche would take the lead. In long stretches of determined, opportunistic aggression, the Wild would catch the young Avs in mistakes and come back. Colorado went up two games to none in the friendly confines of its own building, then scored one goal in two games in Minnesota as the Wild evened the series. The Avs took a 3-2 lead. The Wild tied it. So it came down to one game, the fabled Game 7, which turned into a microcosm of the series. The Avs went up 1-0. The Wild tied it. The Avs went up 2-1. The Wild tied it. The Avs went up 3-2. The Wild tied it. The Avs went up 4-3. With two minutes, 27 seconds remaining in regulation, the Wild tied it, taking a page out of the Avs’ book. And then, like a pool hustler, the Wild took its first lead of the game and first lead of the series with a game- and series-winning overtime goal, its fifth of the game. Suddenly, Minnesota is moving on, to play Chicago. Colorado, which had led or been tied the whole way, is done. On the bright side, it wasn’t nearly as bad as what happened to the San Jose Sharks, who went up three games to none on the Los Angeles Kings, then lost four in a row. That’s embarrassing. What happened to the Avs was not embarrassing. It was a rite of passage for a team whose best players range in age from 18 to 23. “When you learn how to win, not how to win, but you have more experience in the playoffs, then obviously you start to know how to win those big games,” said Patrick Roy, whose first season as Avalanche coach ended on a bittersweet note. Interesting concept, knowing how to win. The Avs proved they can win with desperation. They did it twice in the series, tying a game in the final two minutes, then winning it in overtime. But in a certain sense, desperation is easy. Your job is to go full bore to score because if you don’t, you lose. If your opponent scores into your empty net, well, you were going to lose anyway. Protecting a one-goal lead is a different, more complicated art. You must be more concerned with defense, of course, but you can’t be so concerned with defense that you give away all aggressiveness and momentum, because at that point it’s just a matter of time before your opponent’s onslaught produces a goal. Whenever the Avalanche had the lead, in Game 7 or in the series, it seemed to be unsure how to handle it. “It was a back-and-forth game,” said Matt Duchene, the team’s leading scorer during the regular season who returned from a knee injury to play in the last two games of the series, both losses as it turned out. The enduring appeal of Game 7 has to do with finality. It’s like a Supreme Court decision. There is no appeal. This can produce an excruciatingly boring, careful sort of hockey, but it certainly didn’t Wednesday night at Pepsi Center. This Game 7, the first for most of the Avs and a fair number of the Wild, started with a goal credited to Avalanche defenseman Nick Holden on a rebound just 2:52 into the game. As the puck was crossing the goal line, Avs winger Jamie McGinn was sliding into the cage and its tender, Darcy Kuemper. The goal was first waved off as goalie interference, then the light went on, then it was approved on appeal by Big Brother. The Wild responded 8:04 into the first period when team captain Mikko Koivu fired a shot from the left circle. With Avs goaltender Semyon Varlamov hugging the right post of the goal, Koivu hit the inside of the left post, the first of a series of shots that appeared to be steered by a satellite-controlled global positioning system. The Avs took the lead for the second time when Joey Hishon centered the puck from the right boards for McGinn, who didn’t shoot it so much as redirect Hishon’s pass on net. The puck slithered between Kuemper’s skates. After one period, the Avs led 2-1. Minnesota tied it for the second time 7:27 into the second period. It was not recorded as a power play goal, but it grew out of a power play formation. A penalty to Hishon for high sticking had been over for two seconds when Mikael Granlund tried to replicate Koivu’s shot, aiming for the right-hand edge of the goal from the left offensive circle. 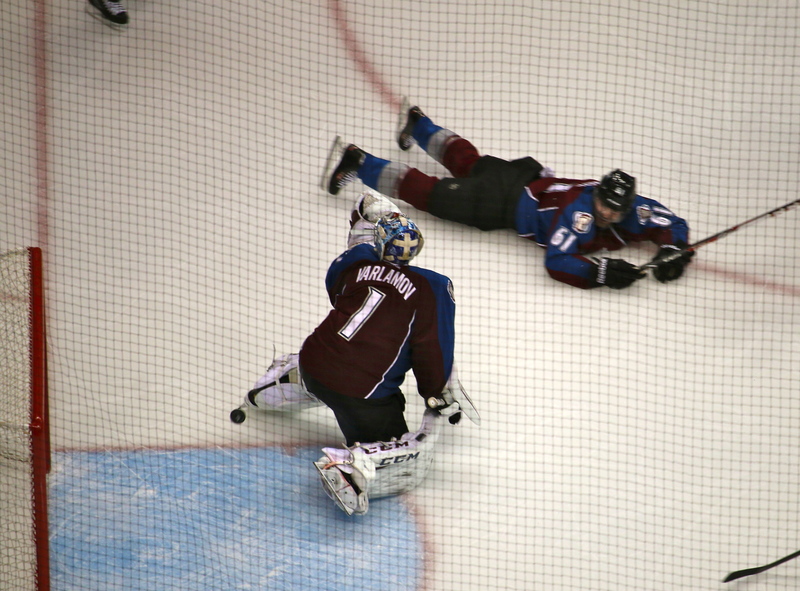 Varlamov slid to his left to block it with his leg pad. Unfortunately, the puck never got there. It hit Holden in the backside, ricocheted off McGinn’s shin pad and bounced to the ice, right in front of veteran Wild winger Dany Heatley. As the puck ran away from him, Heatley took a swipe and sent a knuckleball into the space Varlamov had vacated to block Granlund’s shot. When the second period ended, the score was 2-2. The Avs took their third lead 2:55 into the third period. Winger P.A. Parenteau made a beautiful pass from behind the Minnesota net out to Paul Stastny, between the circles. Stastny one-timed it right back on net, hitting the inside of the left post and watching it bounce in. The Wild tied it for the third time less than four minutes later, 6:33 into the third, when winger Nino Niederreiter took a pass at the top of the right circle and rifled a shot over Varlamov’s right shoulder. You could hear the sound of the puck hitting metal. I’m not sure if it was the crossbar or the left post. I’m also not sure I’ve ever seen a game in which so many goals struck metal on the way in. The Avs took the lead for the fourth time at 11:16 of the third, on a play that began with Parenteau splitting two Minnesota defensemen — Marco Scandella and Jonas Brodin — and getting a point blank shot on Kuemper. The Wild goaltender made the save. Duchene, crashing the net, flicked the rebound over to the right circle, where Parenteau, circling back, passed it to defenseman Erik Johnson up high, by the Stanley Cup logo. Johnson drilled it past Kuemper. Kuemper left the game shortly afterward and was replaced by Ilya Bryzgalov, who started Games 1 and 2 before being relieved. Kuemper conferred with the Minnesota trainer before departing. Bryzgalov would spend 13 minutes, 15 seconds in net. He would be credited with one save. It was a good one. The Wild tied it for the fourth time with 2:27 left in regulation. By Avalanche standards, this was not exactly crossing the Grand Canyon on a tightrope. Yeo hadn’t even pulled his goaltender yet. The Avs tied Game 1 with 13.4 seconds remaining. They tied Game 5 with 1:14 left. This time, they were 2:27 away from winning the game and the series 4-3 and advancing to play the defending Stanley Cup champion Chicago Blackhawks in the next round. Then Wild defenseman Jared Spurgeon, the one faked off his feet by Avs rookie Nathan MacKinnon in Game 2, took a pass in the right offensive circle. MacKinnon, hanging out between the circles, suddenly realized Spurgeon was uncovered and raced over. Spurgeon waited patiently, using the recovering MacKinnon’s momentum against him, just as MacKinnon had used Spurgeon’s against him five games earlier. Once MacKinnon slid helplessly past, Spurgeon lifted a shot over Varlamov’s right shoulder, hitting the inside of the left post and watching it ricochet into the net. Afterward, the 18-year-old MacKinnon blamed himself for the tying goal. It was 4-4 at the end of regulation. The Avalanche had its best chance to win the game in overtime a little more than two minutes in. MacKinnon had the puck on the left side as part of a three-on-two with Johnson in the middle and Gabriel Landeskog on the right side. MacKinnon stopped by the left boards, gathered the puck and centered it to a trailing Stastny, who lifted it toward the top right corner of the goal. Bryzgalov got just enough of his left shoulder on the shot to deflect it wide of the post. Moments later, Minnesota had a chance to win when Granlund beat Duchene to the puck and took a point-blank shot at Varlamov, trying to squeeze it inside the left post. Varlamov kicked it away. Almost five minutes into the overtime, the Avs had another chance when Johnson centered the puck for Parenteau in the crease. The pass was deflected out to Heatley, who passed it up the ice to center Kyle Brodziak, who found himself alongside Niederreiter with only Avs defenseman Andre Benoit between them and the goal. Brodziak passed the puck to Niederreiter. Benoit retreated, trying to cover them both. As Niederreiter approached the net from the right side, Benoit slid to the ice and tried to get in front of him to block his shot. Niederreiter lifted the puck just wide of Benoit over Varlamov’s right shoulder. It hit the crossbar and ricocheted into the back of the net with such velocity that it bounced back out and hit Varlamov on the back of the leg before he could turn around to see where it had gone. The officials had to review it to make sure it had gone in. The overhead camera confirmed it did. The Wild exulted by the boards, feeling all the jubilation of its first lead in the game, first lead in the series, and a series victory all at once. The Avs stood around for a few moments in disbelief that their first moment trailing in the game, first moment trailing in the series, could also be the end of the whole thing. Center-turned-winger Ryan O’Reilly was angry. In time, this will be a relatively easy one to swallow. The Avs are ridiculously young. As an organization, it was the first trip to the postseason in four years. It was also the first season under Roy as coach and Joe Sakic running the front office hockey operation. In time, it will look like a preview of coming attractions. Still, they had persuaded themselves they could do more right away. Josh Kroenke is a busy guy. At 33, he’s the top executive of both the Nuggets and Avalanche and, of course, the son of their owner, E. Stanley Kroenke. He’s also coming off a year in which he put his stamp on both franchises, naming new front office executives (Tim Connelly and Joe Sakic) and new head coaches (Patrick Roy and Brian Shaw). He joined me for a cup of joe this morning at a Starbucks not far from his office at the Pepsi Center. Q: You reset both organizations last year, front office and coaching. Let’s start with the hockey team. How do you think it’s going so far? How do you think, in particular, Joe is transitioning into his new role? A: I think Joe’s doing a wonderful job. Joe is a great communicator. Obviously, I think that Patrick has done a very good job as well. I think everybody is doing a really good job in their new roles. It’s good to see the cohesion that the organization has. Top to bottom, there’s communication at all different levels, and if someone is doing something that someone else thinks they can do better, or they think they can do differently, no one is afraid to communicate about it. And I think that’s great. Q: Were you surprised at how fast they got out of the gate? A: I think we all were. I think that’s a credit to Patrick, but most important that’s a credit to the players. It’s been a rough few years, and we knew when we reset it a few years ago, going young, it was going to take a few years to kind of come together. But I think as fast as it’s come together over these past few months, it’s been great to see, because we knew we had some young talent there. It was just a matter of pointing it in the right direction. Q: How long did you think it was going to take to be a playoff team? A: I wasn’t sure, but I was hoping that we had the right guys in charge, and I think with Patrick and Joe, and Greg [Sherman] as well, I think we do. I think that they’re all doing a great job and I think that with the youngsters, seeing everyone buy in, and then the veterans we have on the squad as well, it’s been really rewarding for me to see how quickly they’ve turned it around. It’s a lot of fun for me to be a part of. Q: Was the Elway model part of your thinking when you decided to go with Joe? A: I don’t know John very well, but I’ve had the privilege to kind of talk to him here and there and pick his brain a little bit. With guys like John and Joe, guys that have competed so long in their respective sports, and with the kind of people they are, I think it lends very well to leading an organization like they do. I think Joe and John know each other a little bit. I don’t know how well they know each other. But I know that Joe respects John, obviously. As far as the John Elway model, I didn’t look into it too much. I looked at making sure we got the right guy for the job. Q: Traditionally it sort of defies history because the history of great players as coaches or GMs isn’t great. And yet it seems as though in this town anyway there are now two models where it seems to be working pretty well. Did you go into that, in terms of the history of it? A: You know, I didn’t go into it too much. I wanted to make sure we had the right people and the right personalities for the job. At the end of the day, you can’t be afraid to put the time in and really put the work in. I think that John and Joe are both spectacular examples of that. Knowing Joe and knowing John a little bit, I know they take what they do very seriously and they’re both winners and they want to win. And until they get to that point, I know that neither of them are happy. Q: You came to your positions with a lot more background in basketball than hockey. How has your personal evolution gone with the game of hockey? A: You know, it’s been a lot of fun. I really enjoy the game. To understand it on a level that I do now as opposed to where I was when I first moved to Denver is night and day. It’s a great game. I can see why so many people love it and so many guys want to get into it at a young age. It’s a true team sport. You meet a lot of great people. Throughout the league, in all these organizations that I’ve had the privilege of being around, it’s wonderful people. Very humble people and a lot of hard workers and they love the game just as much as John loves football or Brian Shaw loves basketball. It’s a great sport to be a part of. The individual stars are going to play well, but it’s all about the hockey assist — who can set up their man and who can set up their teammates. I think it’s probably my favorite sport to attend in person. Sitting down on the glass of an NHL game is an unbelievable experience. Q: What’s been your approach to how close or distant you want to stay from the players? A: That’s evolved over time. Particularly on the basketball side, when I moved here, I knew a lot of the guys. I played against them. I played with Linas Kleiza in college. That’s kind of evolved over time from a peer-to-peer relationship and now that I’m in kind of a supervisor role in both organizations, I’m still close with the guys, I like to have a relationship with the guys, I think that’s important that they feel that on both teams. Went on a hockey road trip earlier this year. That was so much fun. I went on the early season trip to Toronto and Boston and it was great. Great to be around the guys. At the end of the day it goes a long ways; they know that I’m behind them as well. Q: Keeping in mind the Daniel Snyder story in Washington, where the owner’s relationship with star players has been a problem for coaches, as an owner in roughly the same age bracket as the players, is there any issue there for you? A: The locker room is the coaches’ domain. I don’t want to interfere with that at all. Me having a relationship with some of the players on the periphery I don’t think is a problem, and if it ever was a problem I would hope that the coaches would come address it to me right away because I don’t ever want to interfere with anything that they’re trying to do. Q: You’ve got a member of the Swedish Olympic team [Gabriel Landeskog], a member of the Russian Olympic team [Semyon Varlamov], a member of the Canadian Olympic team [Matt Duchene] and a member of the U.S. Olympic team [Paul Stastny]. Were you disappointed Erik Johnson didn’t make the U.S. team? A: I was disappointed EJ didn’t make it. I was hoping that Jan Hejda would get a chance at the Czech Republic team. There’s so many different nationalities; it’s one of the cool things about hockey is it brings together people from all over the world. I was hoping that as many of our guys were going to get a shot as they could, but there were a few guys I was hoping were going to get included but didn’t. Q: So let’s switch gears and talk about the Nuggets. The last time I heard you talk about the state of the team was last year when you did a series of press conferences about organizational changes and free agency, so let’s go back to that point and let me ask you first about the Andre Iguodala deal. When you look back on that, were you disappointed at the time with the outcome? Were you surprised? A: I was more disappointed than I was surprised. We’d done our diligence throughout the year and throughout free agency. We kind of knew there was a chance that he would come back and a chance that he wouldn’t. In the transition period, Tim Connelly didn’t have to hit the ground running, he had to hit the ground in a full sprint. We were able to have good conversations with Andre and his representation. Ultimately, Andre felt it was best for him to go elsewhere. That’s really all I can say about it. He plays for another team now and we’re looking forward. Q: So how do you feel about the moves that you made after that and the roster that you have now? A: I feel pretty good. Andre waited several days into free agency to make his decision and he was our No. 1 priority. We didn’t have any cap space to really use. We were going to re-sign Andre with Bird rights. So there was a different evaluation of players. Looking at our current roster, even without Andre, we felt we were a playoff team. So we wanted to try and bolster our bench and also provide value signings to where we were flexible moving forward. Q: And do you still feel that way? Do you still feel like you’re a playoff team? A: I do. The hard part that comes with professional sports and sports in general is you can’t make an honest assessment until you’re healthy and it’s been a rough year in that regard. Obviously, without Gallo [Danilo Gallinari] and without JaVale [McGee], we don’t know really what we have. I think that our guys have done a wonderful job of stepping up to the plate without a full roster. Q: Speaking of JaVale, I think it’s fair to say there was a widespread perception that you and the organization wanted JaVale to play more and that contributed to the trade of Kosta Koufos. Is that a fair assessment? A: I don’t know if it’s completely a fair assessment. I think we’re always looking at ways to improve our team. Obviously, with the salary that JaVale commands you hope that you get a lot of production out of it, but we don’t ever try to dictate who plays or who doesn’t play. We want to let the coach set the rotation and if he feels that he’s going to win more games with somebody else, then by all means, we should go with somebody else. But JaVale is a talented guy and I think hopefully with more playing time he gets better, but obviously we’ll never know until he gets healthy. Q: Do you see him as an enigma as a lot of NBA observers do? A: He’s an interesting personality. He’s much more intelligent than a lot of people give him credit for. I’ve had the privilege of being around a lot of very intelligent people over the course of my life and sometimes the most intelligent people are the hardest ones to kind of read. And JaVale seems to be that way. I think that the next year or two or three of his career will obviously be very telling — what he wants to do and how he wants to get to the level he wants to be as a player. Q: With respect to Gallo, there have been a lot of different estimates along the way of when he might be ready. Some of them were a lot earlier than now. Do you have any feel for when he might be back? A: You know, obviously we want to get Gallo back as soon as we can, but with an injury like that, you never want to rush it. So Gallo is on Gallo’s time frame. He’s been working his tail off on a daily basis with [strength coach] Steve Hess, [trainer] Jim Gillen and our entire training staff. We have a physical therapist on staff now, starting this year, and I know that Gallo and some of the guys are very pleased with the exercises that he’s provided. With an ACL, you’ve just got to be careful. Derrick Rose sat out the entire year last year to make sure he was healthy. We don’t want to rush Gallo back, but obviously, he’s a huge part of our team. Q: So no specific ETA? A: No, I can’t give you a specific one. I would love to be able to, but I can’t because I would hate to provide the wrong information. Q: What did you make of the last week or so, with the losing streak and the turmoil surrounding Andre Miller? A: You know, I knew there was going to be some ups and downs, and sometimes some of that stuff just has to work itself to the surface. With ups and downs and the transition with the coaching, Andre was somebody that, he thrives in an up-and-down type of pace, but Andre is getting older and we’re kind of in a transition period where we had lost several games in a row and I think Brian was trying different things out. I respect Andre immensely and I respect Brian immensely and I think it was just one of those emotional things that gets the best of people at the time and I don’t anticipate any issues moving forward. Q: Looking back, did you think that perhaps bringing in Nate Robinson and creating a three point guard situation might at some point have to settle out? A: I’ll leave that up to Brian and the coaches to figure out. With Nate, I think the idea that Tim and Brian discussed was to provide some scoring punch, and obviously Nate does that here and there. It was a transition for everybody in the organization, let alone the guys that were coming in from a different team. Nate’s had his ups and downs but he’s a fiery competitor and somebody that we hope can provide some additional benefit to us down the road. One thing I thought that we lost a little bit last year was at certain times throughout the year we didn’t look as tough as we needed to be, and Nate’s a tough guy. Q: You’re about middle of the pack offensively in terms of scoring and in terms of efficiency. Middle of the pack defensively in terms of efficiency. What do you think of the style of play at this point? A: As far as the style’s concerned, I think we’re doing just fine. I think Brian’s going to get better over time as he continues to experiment with different things that he thinks are best for our team and best for our personnel. We started off kind of slower earlier in the year, and I think that was by design. Then I think we got into running more and more, and our pace continued to improve. With the injuries we just don’t exactly know how everything is going to shake out until we get healthy because we have some talented guys that aren’t playing right now. I think with a new system and a fresh idea with some of the guys that are kind of entering their defining years on what’s going to happen with them and their careers, it could be all over the place. I don’t know how to exactly answer your question because we’ve done a few different things throughout the year so far. We started off slow and now we’ve kind of sped it up a little bit. We want to get out and run. We’re at the mile-high. That was one of the things that Tim and I talked about initially when I interviewed him, was we like to play fast here. We want to get out and go and take advantage of our natural resources. Q: It looks like you’re playing about as fast as last year, but your shooting percentage is about four points below where it was last year. Do you think that’s about the people or the mix? A: I think it’s a combination of everything. We started off 0-3. We played a really difficult game in Sacramento. It was such an emotional night for the city, that was going to be a tough one to win. And then we came back and we got thumped by Portland who, it turns out, is pretty good. And then we had to play San Antonio, who we also know is pretty good. Then we went on a little run, we won seven or eight in a row, and then we were kind of here and there, here and there, and then we lost seven or eight in a row. There’s going to be ups and downs. I think the most difficult part of sports, one is injuries and two is staying patient with the team and the people that you have. Everybody is so competitive and they want to win, but you have to have a much bigger picture in your mind over a period of years. I think we’re right about where I thought we’d be. I think we’re right where we were last year at this time, almost. Q: I think Brian had it flipped. He said after the win over Memphis that you were right where you were a year ago after 32 games, at 15-17. I think you were 17-15 last year, and you were about to go on that run where you won 16 out of 19 or something. A: I knew we were right around where we were. But there’s going to be ups and downs. Ultimately, I don’t look for the big swings. I look for a growth chart that has its ups and downs but is steadily improving. Q: More than a few fans think that a bunch of these guys are pretty much your average, replacement-level NBA players. Whether it’s Hickson or Arthur or Foye or Nate — journeymen, guys who have been around. So when you talk about the people who are about to define who they’re going to be as players, who are you talking about? A: We have several of those guys, guys in their mid-20s really starting to show if they’re going to take a leap or if they’re going to remain who they are, I think. Those are big-time growth years as a person, and you figure out who you are. I think we have several guys. You can just look at our roster and go down, look at the ages, and we have several guys that are in that time frame. And there’s a couple guys we think have a chance to be pretty doggone good and there’s a few guys we’re still waiting to see who they are and who they want to be. Q: You don’t want to talk about specific names, I take it? A: No, but you can look at the roster and look at the ages. We have a lot of guys that are clumped together along with one or two guys, like Randy and Nate and Andre, that are a little bit older. And then we have a couple guys that are younger. But then there’s a stack of guys that are all around the same age there, within a few years of each other. Q: What’s fair to expect from Ty Lawson? I think there’s some frustration that he looks so good sometimes and then the rest of the time, not so good. A: You know, Ty’s been through a lot here in Denver. He was somebody we had our sights on in the draft, we were able to get a hold of him through a trade and he’s developed here the whole way. I think Ty has unbelievable potential. I think he can be one of the best guards in the league. It’s a matter of him getting comfortable with the offense and comfortable with himself being an alpha like that. Is he a true alpha? I don’t know. Ty’s as good as he wants to be, I think. He has that type of talent. Q: If you were talking directly to your fans and addressing the perception that you’ve taken a step back, what would you say? A: I addressed the team earlier this year and I said, ‘Sometimes, going to a place you’re unfamiliar with can lead you to a place you’ve never been before.’ I think that’s kind of the general message that I tell myself. Sometimes you have to take a slight step back to take a bigger step forward. With the coaching change, I’m more than happy with Brian. I think he’s doing a great job. George [Karl] did an unbelievable job when he was here. I have the utmost respect for him. I try to tell people how difficult a summer it was for me, but I don’t know if anybody really understands. I think it’s a bright future. We have a lot of very good players, we have a lot of flexibility and I’m really excited. I think it’s going to be a great thing for us moving forward. I understand the hesitation because we had such a great season last year, but I’m really excited about the future. Hang around the Avalanche long enough, especially on a Saturday night when franchise royalty is on hand, and you’re tempted to ignore the one dark cloud and hope it goes away. That’s what the Avs are doing, and they’re doing it exceptionally well. Barely 48 hours after starting goaltender Semyon Varlamov surrendered to police and spent a night in jail on domestic violence charges, the Avs won both ends of their first set of back-to-back games of the season, with Varlamov in net for the first. The Avs are now riding their second six-game winning streak of the year and they’ve played just 13 times. The turnaround in the team’s performance since Patrick Roy took over as head coach is something pretty close to miraculous. After surrendering 152 goals in 48 games last season with the same goaltending tandem — Varlamov and veteran J.S. 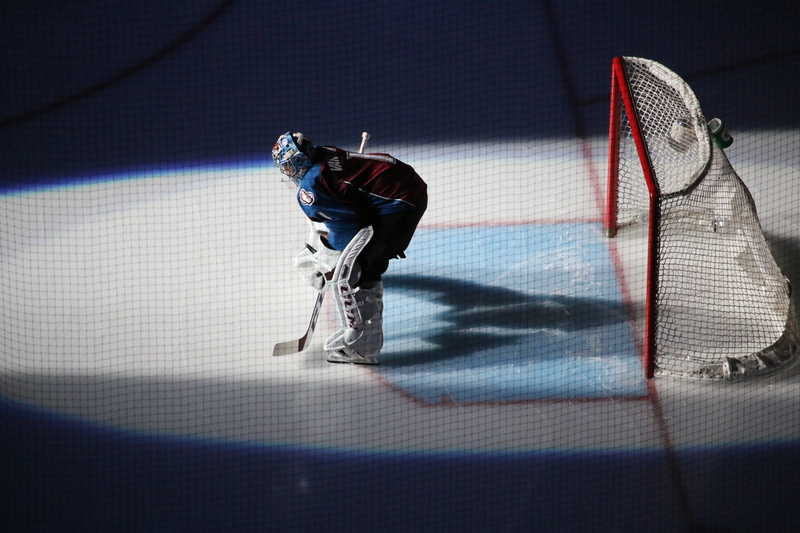 Giguere — the Avs have surrendered just 19 in 13 so far. Giguere, who got the win Saturday night and has given up three goals in four games, said all three stars of the game could have been Avalanche defensemen, quite an endorsement of a group much maligned just a year ago. Roy always makes sure to credit the back-checking and tracking work of his forwards, a key part of his strategic approach. Hockey is a game prone at times to mythic themes, and Saturday night was one of those times. When Roy’s first game as an NHL coach against his original team, the Canadiens, is a secondary story, there’s a lot going on. The Avs are very fond of tribute ceremonies and enormous paintings. The decision to raise defenseman Adam Foote’s jersey to the rafters gave them an opportunity to conduct one of the former and commission two of the latter. It also served as a reminder of the vision Roy and executive vice president Joe Sakic are trying to translate into trophies for a second time. With Peter Forsberg, Ray Bourque and Alexei Gusarov in the house, there were plenty of role models around. This year’s entire squad was out early for the ceremony. They were reminded that they aren’t the only young team to suffer through trying times before finding their stride. Foote caught the end of the lean years in Quebec before moving with the organization to Denver in 1995 and winning Stanley Cup championships in 1996 and 2001. He’s now working as a defensive consultant with the Avs, so I asked if he saw parallels. “Yeah, for sure there are,” he said. “I think the leadership with Roy and Joe is huge, very calming for them, just like they were as leaders for us. They believe in what they’re going to do and this confidence just floats out into the room. The players, I think, can sense it. “When Roy came to our team, traded from Montreal, he brought accountability to the locker room. It doesn’t matter what the professional sport is. You can’t win, the coach, the GM, the owner, they can’t hold you accountable. It’s got to come within the locker room, and he taught us that. That was probably one thing we were missing. Him and Mike Keane. Mike Keane was an unreal leader. At the other end of the spectrum is the 36-year-old Giguere, a Conn Smythe trophy winner and Stanley Cup champion himself in his younger days. When your starting goaltender spends a night in jail, attention naturally turns to his backup. Giguere is the best interview in the room, a smart, thoughtful player willing to speak his mind, as he did last spring when he ripped unnamed teammates for thinking more about summer vacation than finishing the season strong. But questions about Varlamov make him uncomfortable, as they do his teammates and club officials. What are they going to say? They support their teammate. These are only allegations at this point. Let the process play out. We won’t even know how serious that process is likely to be until the Denver district attorney decides what if any formal charges to file. The charges on the arrest warrant were pretty serious — a felony kidnapping count and a misdemeanor assault charge — but there’s no way to know if the DA’s charges will follow suit. If charges are filed, it’s hard to imagine the legal process working quickly enough to endanger Varlamov’s availability to the Avalanche this season, so long as the club continues to stand by him. And so far, there doesn’t appear to be much public relations risk of standing by him. So when a national reporter asked Giguere if he could understand some fans being happy he was in goal Saturday night rather than Varlamov, he declined comment. Still, there’s a legitimate hockey question about Giguere’s playing time simply because he’s been nearly perfect so far. As good as Varlamov has been, Giguere has been even better. The lone goal he gave up in Saturday’s 4-1 victory over Montreal was just the third he’s surrendered this season in four starts. The year Roy turned 36, he started 63 games for the Avs and put up a goals-against average of 1.94, the only time in his career he was below 2. He also had a career-best nine shutouts. I’d been meaning to ask Giguere if he thought he was in good enough shape to play more, but asking him Saturday gave the question Varlamov overtones and he handled it like a live grenade. The team has generally taken the approach of not commenting on the Varlamov legal matter, but Roy did answer one question after Saturday’s game. He was asked whether his response to the Varlamov allegations — to put him back in net immediately, about 36 hours after he got out of jail — was informed by his own experience, back in 2000, when he was arrested for domestic violence after police responded to a 911 hangup call from his wife at the time. They found physical damage to the house and took Roy into custody. There was never any evidence of injury to his wife, just to a door in the house, so charges were dismissed. In this case, the police report confirmed bruises on Varlamov’s girlfriend, Evgenia Vavinyuk, consistent with a physical encounter. So this might be more complicated than Roy’s case, but we’ll know soon enough how Denver DA Mitch Morrissey sees it. Until then, the goaltending rotation will remain what it has been. Varlamov, 25, has started nine games and has a record of 8-1 with a goals-against average of 1.78. Giguere is 4-0 with a GAA of 0.75. The renaissance of the Avalanche under Roy is the NHL’s best early-season story. Except for that black cloud, the Sakic-Roy management era couldn’t be off to a better start. Patrick Roy’s return to the NHL as Colorado’s head coach has generated plenty of hype, especially in Canada. After he answered questions posed in English following his team’s morning skate today, he answered a couple posed in French. Still, he’s taking over the second-worst team in the league last season, so I asked him, in English, what is fair to expect from the Avalanche this season in his first year as head coach. Brave talk is common this time of year, of course. The Avs have been full of hope before each of the past three seasons, but that didn’t stop last season from being their worst since the franchise moved to Colorado from Quebec. Only Florida registered fewer points in the standings. The Avs’ point percentage was their lowest since the 1991-92 season, when they were the Quebec Nordiques. Nevertheless, this year’s team is stocked with a group of talented young players reminiscent of those young Nordiques. With franchise legends Roy and Joe Sakic having taken the controls — Roy on the ice and Sakic in the front office — the Avs are convinced that things are looking up. “In this dressing room, we’re expecting nothing less than a playoff spot,” 20-year-old power forward and team captain Gabe Landeskog said when I asked about fair expectations. However it turns out competitively, the league’s realignment should provide a relief to fans, and perhaps a little juice at the gate, too. Gone is the little-lamented Northwest Division that seemed to pit Colorado against Calgary every other night. The Avs are in a new Central Division that includes the defending Stanley Cup champion Chicago Blackhawks along with the Dallas Stars, Minnesota Wild, Nashville Predators, St. Louis Blues and Winnipeg Jets. With four players selected among the top three picks of their respective drafts — defenseman Erik Johnson (No. 1, by St. Louis, 2006), center Matt Duchene (No. 3, 2009), Landeskog (No. 2, 2011) and Nathan MacKinnon (No. 1, 2013) — the Avs have lots of skill. Whether they have the other characteristics that make up a winner is a different question. Beaten down by constant criticism as the team foundered under former coach Joe Sacco, several players mentioned the upbeat approach Roy has brought to his first NHL head coaching assignment. Near the end of last season, veteran goaltender J.S. Giguere ripped into unnamed teammates for being too ready for summer vacation. So I asked him where the sense of urgency missing a year ago needs to come from. On paper, the Avs look like they could pull off a turnaround season. Their top lines — Landeskog, Paul Stastny, Alex Tanguay; Ryan O’Reilly, Duchene, Steve Downie; Jamie McGinn, MacKinnon, P.A. Parenteau — have plenty of speed, skill and scoring ability. Stopping their opponents from scoring — the Avs gave up 152 goals in 48 games last season — is another matter. Everybody knows the history of Hall-of-Fame players trying their hand at coaching. It’s not good. But Roy paid his dues at the junior level and his players clearly believe in him. Still, surprising the world of hockey has been easier said than done for the Avs lately. As a player, Roy often wrote big checks with his mouth, then cashed them between the pipes. The Avs desperately hope he can do the same from behind the bench. Colorado’s trip down memory lane: Tradition or nostalgia? John Branch once covered the Colorado Avalanche for the Colorado Springs Gazette, so the shots he took last week at the club’s foray into the past were not ill-informed, even if he now works for The New York Times. Branch looked at the spate of hirings of former star players by Denver pro sports franchises — John Elway with the Broncos, Walt Weiss and Dante Bichette with the Rockies, Joe Sakic and Patrick Roy with the Avs — and concluded Colorado is now mired in nostalgia, an instinct that is seldom rewarded in pro sports. Picture the Bay Area in 2030 if its teams hired Buster Posey, Joe Thornton and Stephen Curry. That would be preposterous. But not in Colorado, the sports recycling capital of the nation. Around Denver, old athletes do not fade away; they return to remind everyone what probably will not happen again. Memo to my old friend John: This might not be just a Denver thing. The Kansas City Royals announced just today that George Brett is joining the club as hitting coach. Bart Starr was a two-time Super Bowl winner as the Packers’ quarterback, but went 52-76-3 as the team’s coach. Magic Johnson was one of the best basketball players in history, leading the Lakers to five NBA championships, but he lasted only 16 games as their coach before throwing up his hands in frustration. Ted Williams was one of the best hitters in baseball history, but over four seasons as manager of the Washington Senators/Texas Rangers, he went 273-364. Isiah Thomas was the heart of the Bad Boys’ back-to-back NBA championships in Detroit, but he was 55-108 in two seasons as head coach of the Knicks. And, of course, there was Wayne Gretzky, the Great One, the best hockey player ever, who was decidedly not the best hockey coach ever. He went 141-161-24 in four seasons as a coach in Phoenix. Attempts by great players to bring back their glory days from offices in the executive suite have generally not gone much better. Thomas, Michael Jordan, Kevin McHale, Bobby Clarke and Elgin Baylor are among those who have taken swings from the front office with limited success. Elway has so far proved an exception to this latter pattern, and it was arguably his success that got Denver’s other franchises on their current nostalgic roll. Elway took over the Broncos’ front office a little more than two years ago. In 29 months, he has remade the roster, attracting top free agents such as Peyton Manning and Wes Welker and giving the Broncos their best chance to contend for a Super Bowl since he retired as a player in 1999. Following the Broncos’ 13-3 campaign last season, the Rockies dipped into their own brief history, hiring Weiss, their former shortstop, as manager, and Bichette, one of the original Blake Street Bombers, as their hitting coach. Now it’s the Avs’ turn, naming Sakic to run the front office and Roy to coach the team — Hall of Famers who owned the town during the Avs’ glory days, which included Stanley Cup championships in 1996 and 2001. Branch finished his essay in the Times by suggesting they’re next. With Chauncey Billups’ playing career winding down, how long can it be before the best basketball player to come out of Colorado assumes a navigational role with his hometown team? So I asked Roy about this charge that he’s the latest resort in a trip down memory lane. “I read that article,” he said. “It’s very simple. I don’t think I’m here because I’m an ex-Avalanche. Just think about it: Those years in Quebec (as coach and general manager of the Quebec Remparts, a junior hockey franchise), if I was just Patrick Roy the player, I wouldn’t have lasted eight years. “At first, yes, the player’s going to look at you and he’s going to say, ‘Wow, it’s our coach.’ But that doesn’t last very long. Eventually, you have to show them that, ‘Hey, he’s got the solution, he’s got ideas, he’s getting us going.’ At the end, they’re not going to see me as former Avalanche goaltender Patrick Roy. They’re going to see me as their coach. As Branch pointed out, earlier forays into the past have not worked out that well for Colorado sports teams, whether it was Dan Issel as coach and general manager of the Nuggets or Bill McCartney protege Jon Embree as coach of the University of Colorado football team. But Branch’s brush is a bit broad. Weiss and Bichette were good baseball players, but they are not Hall-of-Famers, so they don’t face the same daunting history as Elway, Sakic and Roy. Lots of former players have played the roles they’re playing now for the Rockies, many of them successfully. Among the Hall-of-Famers, Elway is off to an auspicious start with the Broncos, and Sakic and Roy have a few things going for them as they take over operations for the Avs. For one thing, the team has nowhere to go but up. It has missed the playoffs four out of the past five seasons and competed with Florida last season for title of worst team in the NHL. For another, the NHL draft on June 30 will provide the Avs with their third top-three draft pick in five years. As Roy pointed out, he is not trying his hand at coaching for the first time, as Gretzky was when he took over the Coyotes. Roy cut his teeth at the junior level for eight years. He knows the job, he likes it, and he was good at it working with players from 16 to 20 years old. Now he’ll have to see how he does with grown-ups. Is his hiring in part an attempt to take advantage of his popularity and name recognition? Certainly. The Avs need the buzz, and nobody creates buzz around hockey in Colorado like Patrick Roy. But it’s hardly out of left field. In fact, of all the nostalgic hires in Denver over the past three years, Roy has paid the most dues to earn his opportunity. History makes it easy to be cynical about the move, and it’s certainly possible that it won’t succeed. But the fact remains that Roy and Sakic can’t do any worse than the men they’re replacing. If the question is why, the answer is, why not? Saturday night at the Pepsi Center, after the Avalanche lost its second game in a row and dropped three points out of the NHL playoff bracket, I asked coach Joe Sacco how his newest charges, recently-acquired forwards Steve Downie and Jamie McGinn, were fitting in. Twenty-four hours later, McGinn scored both goals in the Avs’ 2-0 victory over the Wild in St. Paul, Minn. Neither was the sort of pretty skill play the club so often requires. Both were rebounds in tight spaces amid the scrum of bodies around the goaltender’s crease, the sort of play hockey folks call gritty. Following Sunday’s win in Minnesota, the Avs are within one point of eighth place in the West. These battles they’ve been fighting over the past several years to sneak into the bottom of the playoff bracket are not particularly inspiring to fans once accustomed to true Stanley Cup contention, but they are better than being completely out of it, as the Avalanche was in two of the past three seasons. For years after their arrival from Quebec in 1995, the Avs could count on selling out every home game. Their average attendance was always 18,007, the building’s capacity for hockey. Since the sellout streak was broken during the 2006-07 season, their average home attendance has slipped from 17,612 that season (13th in the league) to a low of 13,947 (27th) in 2009-10. This season, it has rebounded to an average of 15,455 (23rd) through 34 home games. They have accumulated enough young skill players to climb back into hockey relevance. In Matt Duchene, Ryan O’Reilly, Paul Stastny and Jay McClement they have four legitimate centers around whom to rotate a group of wingers they’re still working on. In 19-year-old left winger Gabriel Landeskog, they have a candidate for the Calder Trophy as rookie of the year and an emerging star at power forward. Young goaltender Semyon Varlamov has been up and down in his first season in Colorado, but he may be heating up at the right time. He has surrendered four goals in his last five starts, two of them shutouts, and is 4-1 over that span. The defense, too, has been inconsistent, but former first overall draft pick Erik Johnson seems to have regained his confidence, and Ryan Wilson, now paired with Jan Hejda, has been arguably the team’s best blue-liner. Avs fans are understandably tired of hearing about potential. In a league where 16 of 30 teams qualify for the playoffs, their team has failed to make the cut in three of the past five seasons. It is time for all the trades and all the high draft picks to start producing results on the ice. The Avs have 15 games remaining. I asked Sacco how he sees his club’s prospects of climbing back into the playoff picture and staying there. “I like our chances,” he said. “I like the group that we have in here. We’re resilient. We’ve had a couple of different scenarios during the course of this year where we looked like we might have been down and out, but we came back. This situation that we’re in right now is no different. Adding the grit of Downie, now injured, and McGinn was not only an admission that the Avs were a little soft. It was also a suggestion that toughness was the final ingredient necessary after years of accumulating young talent. There’s a lot to like about the young Avs, but a fan base can live on promises only so long. Since moving to Colorado, this club has never missed the playoffs two years in a row. Now would not be a good time to start. Before Saturday night’s game, the Avs held a ceremony honoring Rob Blake, who retired as a member of the San Jose Sharks at the end of last season. Blake came to Colorado in a trade from Los Angeles near the end of the 2000-01 season, just in time for the club’s run to its second Stanley Cup. At the season opener last fall, they held a ceremony honoring Peter Forsberg, who finally gave up the ghost of a comeback last year. Joe Sakic is now in their front office. Milan Hejduk, the last remnant of the good old days, has slipped to the fourth line. It’s time to stop looking backward. The glory days were great, but they’re long gone. The last Stanley Cup parade was more than a decade ago. It’s about time for these new Avs to show what they’ve got.